...because we design & advise people on starting, building & improving rescue and boarding catteries and kennels worldwide every day. It's why this isn't just a directory of addresses and numbers! Our expert knowledge and animal welfare background enables us to know exactly what questions to ask catteries to assess their quality standards. 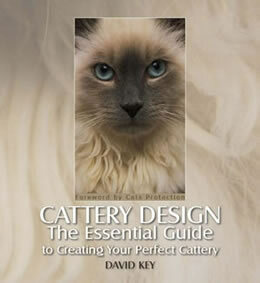 Kay & David Key also publish & author the 'bibles' on cattery and kennel design. Because we design catteries & help build them correctly, we know up to 3 years in advance of a fabulous new cattery opening as we guide people from thinking about it, right through to opening or relaunching. Kay (left) created this site to help high standard catteries and caring cat owners find each other. The typical standard of catteries is pretty low. I expect you've visited a few yourself and been horrified. But there ARE wonderfully caring catteries who want to create a lovely place for cats to stay... and it is these people I want to introduce you to. Every day I talk to people going to great lengths and expense to build or upgrade their cat establishments - researching the best designs and discovering how to make catteries a more fun, quiet and stressless place for cats to be. Caring, quality catteries do exist and they are the ones that truly deserve your custom. they won't stop until customers stop giving them business. Great catteries are PROUD of their facilities and want to show them off. hide as much as possible from you & may not even allow you to see the cattery. if you don't, you are keeping them in business. You can't rely on the fact that they are licensed - so many appalling catteries are still licensed by the local authority. The reason they are so cheap? - usually old, decaying buildings that are unsuitable for cats, which are poorly maintained and/or staffed inappropriately. Have you searched for catteries and wondered why it's so rare to find any with lots of photos? or any closeups? distant, hazy, tiny images (or even any photos at all)? Neglected old catteries are unlikely to show you detailed photos (although some do!) - either on their own website or this one. They usually won't be attracted here, where we focus on professional, caring and high quality boarding catteries. Don't send someone else because you can't bear to go - choose from good catteries in the first place. Make the effort and visit the ones you shortlist - don't put yourself in the position of leaving your cat where they will become distressed, thereby ruining your holiday and possibly your cat's wellbeing. Sign up & tell us what you're looking for in a cattery, and we'll help you find the best one for YOUR cat - and help the owners of the future cater for your needs by providing them with statistics on the type of facilities and services cats and their owners really want. to help us shape the catteries of the future. help you search for the ones who can provide the best care for your cat (whether young or old, diabetic or with other health problems or specific needs). Taking the time to search for a better standard of cattery will help you find a place where your cats will bond with their carers, have fun playing and staying in calm, relaxed style. You'll be so happy you did!